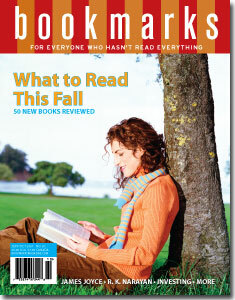 Bookmarks Magazine – All about books! You may or may not have noticed that my posting has been a little erratic this past week. This is because I traveled across the country for my company’s National Sales Meeting in California. While the meetings were good, it left my brain totally fried and my body screaming at me for more sleep, so I did not get to update as consistently as I hoped that I would be able to. Personally, though, I enjoy traveling and flying on airplanes. The idea of being “stuck” on a plane for 5+ hours is dreamy to me because it provides me with that many uninterrupted hours with which I can read. For this trip, I worked on wrapping up The Night Circus, but I wanted to bring a magazine or two along so that I could switch over to something different, if necessary. So, the night prior to heading out, my husband and I went to Barnes & Noble and scoured the literary magazines. The scouring paid off. I discovered an excellent magazine called Bookmarks. Their tagline is – For everyone who hasn’t read everything. Well, that’s me. And I always want new recommendations. When I’m less than halfway through any given novel, I’m thinking ahead to what I’m going to read next. This magazine is chock full o’new books (separated by genre), paperbacks, recommendations from book clubs, etc. Flipping through this for a few minutes, I walked away with at least 5 books that I want to read within the next year. I’m ecstatic that I stumbled upon this (a magazine that I had no idea actually existed) and wanted to share it with you!